In my very first participation for the Thursday Movie Picks for 2017 created by Wanderer of Wandering Through the Shelves. 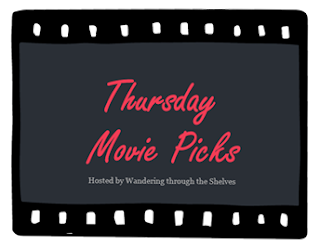 The first week is devoted to the subgenre of the legal thrillers. The genre where lawyers find themselves in danger or dealing with something that is beyond their control. The objective is to choose three films of that subject matter. 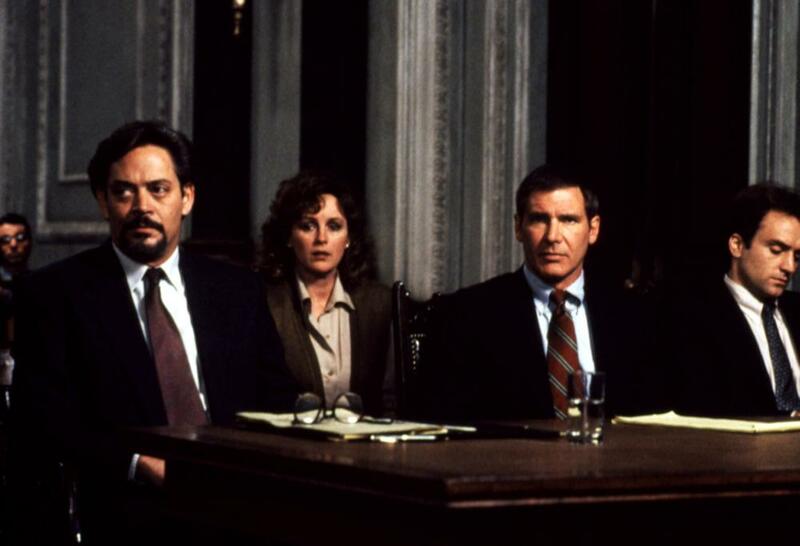 Alan J. Pakula’s 1990 legal thriller is an unusual film in the genre as it’s really more of a suspense-drama than a thriller. It is this very intriguing story about a prosecutor who has an affair with a colleague who is later murdered as he is the prime suspect. It’s a film with a great cast led by Harrison Ford as the man who cheats on his wife with this colleague played by Greta Scacchi. Yet, the film really kind of belongs to the late Raul Julia who always steal the show any chance he gets as a rival of Ford who would defend him. It’s a film filled with a lot of nice twists and turns with a killer ending as it is one of Pakula’s finest films. If there’s one film that truly fit the standard of a legal thriller, it’s this film that is based on a novel by one of the genre’s masters in John Grisham. This film remains the best as it involves Tom Cruise as this young lawyer who is asked to be part of this prestigious yet mysterious firm that has a very dark secret. Featuring a great ensemble cast that include Gene Hackman, Jeanne Tripplehorn, Holly Hunter, Ed Harris, David Strathairn, Wilford Brimley, and Hal Holbrook. The film is definitely one of Sydney Pollack’s finest films as it features a great score by Dave Grusin as it is one of these thrillers that is smart and engaging. While it may not be as good as another of Gregory Hoblit’s legal drama in Primal Fear, this film does have its moments as it is this intricate tale of murder where a man has been accused of shooting his wife yet he would defend himself against a young, hotshot district attorney. It is a film with a lot of flaws yet it is the performances of Anthony Hopkins and Ryan Gosling that makes it work and watchable no matter how silly some of the plotting is. It does have moments where Hopkins and Gosling confronting each other make it feel like a different movie where it’s two masters going mano-a-mano in who can outwit who. Fracture got a lot of love this week! I haven't seen your other two, but I should revisit Fracture again. I only saw it the one time. It is a flawed film but it is kind of worth watching. Especially because of Ryan Gosling and Anthony Hopkins. Nice choices, two of which I haven't seen anywhere else this week. 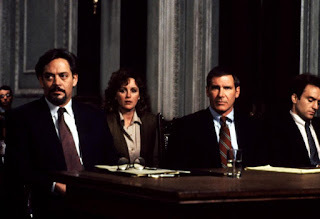 I haven't watched Presumed Innocent in years but it was a very good film and that cast can't be beat. Raul Julia always stood out but I loved Bonnie Bedelia in the film. Of course I love Bonnie Bedelia in everything. I should really watch it again some time soon. I'm not a big Cruise fan so I think I would have enjoyed The Firm with a different leading man but even with him it was a good enough suspense film. Fracture really was one of the titles of the week. The performances were excellent but it still surprised me a bit since I didn't realize it had so many fans. This is a genre that I'm a big fan of and will always give something with a courtroom setting at least a try so choosing three was pretty effortless this time, can't say that for every week. Seems like everyone went with The Firm, this week. I really need to watch this one. I have seen The Firm and quite enjoyed it. @Joel65913-I keep thinking about putting in Primal Fear but I feel like everyone was going to do that one. I went with a lesser film. I'm not a fan of Tom Cruise either as I think he's overrated and a vain shithead but he is good in The Firm. I haven't seen Witness for the Prosecution but I have it in my DVR list. 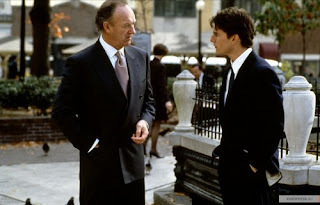 @Wendell-The Firm deserves a re-watch as it is the film that made John Grisham a subgenre. I almost picked Presumed Innocent...really love this movie and the music. The Firm is also good, not great but fu. To watch. The last one is quite good also. Great picks! @Birgit-Thank you. I saw your picks and thought they were good as well. It's been too long but I think I enjoyed The Firm - the movie. They actually made a TV series out of it in 2012 too which I think no one saw. What they should have tried instead, is do one of Grisham's other yet to be adapted legal genre books. @Wanderer-I did read they made a TV adaptation of the film but I don't recall seeing it at all. I agree with you that they could've done something else but then again, when was the last good John Grisham film adaptation?